The Mezzanine is located on the second floor and is accessible by elevator, with two distinct spaces. 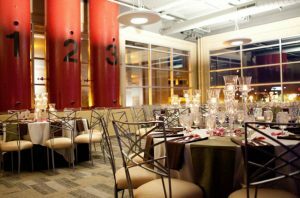 The Mezzanine Room is perfect for smaller parties, dinners and corporate events. The Mezzanine Balcony can be used in conjunction with the Main Hall as overflow space or as functional seating/cocktail space. Square Footage of Room: 1,200 Sq. Ft.
Satellite bars and buffets are available in this space! Built-in draping is in place to separate the room from the balcony area for more private events.